Most of us are familiar with the story in Matthew 22:34-40, where the expert in the law asked Jesus the question, “Teacher, which is the greatest commandment in the law?” Jesus answered his question by quoting Deuteronomy 6:5 (the Shema). He then added what most of us would have thought was a new twist to their thinking when he continued, “And you shall love your neighbor as yourself”. Jesus seemed to be adding a New Testament requirement of love to the legalistic framework of the law. But, was this the case? Where did Jesus come up with his addition to the Shema, ”to love your neighbor as yourself”? Was this a new idea from our rabbi? What was Jesus really trying to say in answer to the expert’s question? Let’s take a closer look. It is a surprise to find that Jesus’ command to love your neighbor as yourself comes from Leviticus 19:18 in the Old Testament! To confuse matters further, when asked for the greatest commandment, Jesus gave two! How many great commandments were there, one or two? By looking at the Hebrew meaning of the words, ”and you shall love your neighbor as yourself” and by situating them in their original Jewish context we will be able to better clarify what Jesus was really saying and draw attention to a vital point that Jesus was making in his reply. This point is not obvious to a western thinking person only reading the passage in English. Ve’ahvta – As we learned in our recent study of Deuteronomy 6:5, this means, ”and you shall love”. In fact, this phrase only occurs three times in the Torah, two of them in Leviticus 19 (verse 18 and 34), and the other in Deuteronomy 6:5. This will become an important point later in the study. You can re-read our post on Shema – Part 2 for a more detailed explanation of ve’ahvata. Reahka – “Your neighbor” – typically means companion, fellow, kinsman, or friend. But, from the Good Samaritan story, we know Jesus expanded the concept of neighbor far beyond kinsman or friend. You can read the post on “The Good Samaritan” for a more in depth look at who our neighbor really is. Kamokha – “As / like yourself” – literally means, “like yourself”. To love your neighbor as you love yourself is obviously a worthwhile goal. However, this phrase can also read in a different way, “love your neighbor who is like or similar to yourself”. Supporting this interpretation, just a few lines later in Leviticus 19:34, this verse has exactly that sense. To paraphrase this verse, “Show love to foreigners because they are like yourselves – you also were once slaves in Egypt”. This idea of comparing ourselves to our neighbor makes sense when you re-read Leviticus 19:18; don’t seek revenge or bear a grudge, but love your neighbor who is like yourself. When you get angry with your neighbor, don’t forget that you are the same way. We are all flawed and sinful and we all suffer from the same problems. We are all in need of God’s mercy. This brings to mind the Lord’s Prayer, “forgive our debts as we forgive our debtors”. This interpretation takes loving our neighbor to a deeper level and puts our love for the people around us in the proper perspective. We are all flawed and hurting, so try to have compassion and a good word for those around you. When you examine Jesus’ answer from a Jewish historical perspective, another fascinating interpretation is revealed. The expert in the law was not asking Jesus which commandment was above all the others, but which one best summarized or encompassed all the others. Before and after the time of Jesus, the sages of Israel debated and attempted to formulate a condensed set of principles that would represent the whole Torah. What few verses best summed up the foundational principles that the whole Torah espoused? They debated and some chose Micah 6:8, others Habakkuk 2:4, among others. Jesus’ response to the experts questions was his brilliant answer to this summary principle that the rabbis had so long discussed. Jesus did it by employing a foundational method of teaching in Hebrew known as “gezara shava”, which means a comparison of equals. This method used scripture to interpret scripture. Two texts could be united to one another for mutual interpretation by a word or words that they had in common. To understand the meaning of a verse, you would look in the Torah and see where else that same key word or phrase was used and then use one to interpret the other. In Jesus’ answer, he connects (ve’ahvta) – and you shall love the Lord your God of Deuteronomy 6:5 with the (ve’ahvta) – and you shall love your neighbor as yourself of Leviticus 19:18. Leviticus 19:18 is not a secondary command, but is the equivalent of Deuteronomy 6:5 and each may be used to explain and understand what the other means. Jesus brilliantly links the two scriptures together, so that the two become one! The Shema is fulfilled by the doing of Leviticus 19:18, loving your neighbor as yourself! Did they catch this brilliant interpretation? Listen to the apostle Paul in Galatians 5:14 as he states what he learned from his Rabbi Jesus. “The entire law is summed up in a single command, “Love your neighbor as yourself”. Paul got it! Doesn’t this also sound just like the golden rule of Matthew 7:12? “So in everything do to others what you would have them do to you, for this sums up the Law and Prophets”. Also, take the time to read Romans 13:8-10 which contains the same message. From the master teacher himself we now know that our command to love God with all our heart and soul and might is fulfilled in the act of loving your neighbor as yourself. Everything else is “just commentary”! The words of Deuteronomy 6:4 and the instructions that follow in verses 5-9 are perhaps the most crucial Old Testament texts for the foundational teachings of both Jesus and Judaism. These verses were so important to the lives of the early Jewish people that they became the centerpiece for Jewish daily worship since well before the time of Jesus. In fact, early sources confirm that Deuteronomy 6:4 would have been the very first portions of the Hebrew Bible that Jesus would have committed to memory. Jewish boys were taught this biblical passage as soon as they were old enough to speak. This early teaching was always done by the father, so Joseph would have taught his son the these verses on his knee as a very young boy. It is also important to note that this pivotal set of verses was located as an introduction to the first paragraph of the instructions that God gave to Moses in the book of Deuteronomy. The book of Deuteronomy was by far the most popular text during the time of Jesus. More copies of the book of Deuteronomy were found in the Dead Sea Scrolls than any other book. 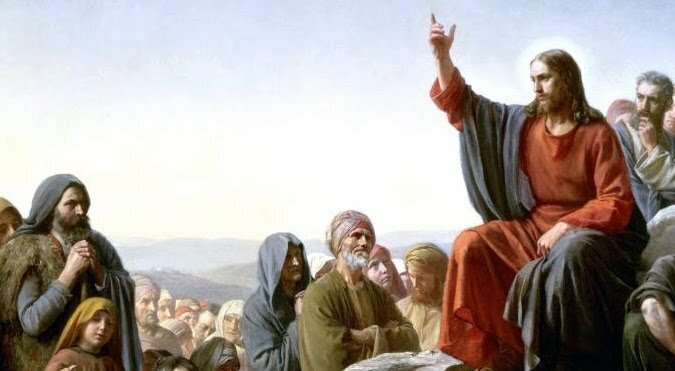 Jesus quotes from Deuteronomy more than any other book and in the beginning of his ministry, when he was tempted three times by the devil in the wilderness, he quoted three separate verses from Deuteronomy in response (Read Matthew 4:1-11). These powerful verses from Deuteronomy 6 are referred to by the Jewish people as “Shema”, which literally means “hear” or “listen”. Most Western Christians have never even heard of the Shema. However, these verses were so central to Jesus’ faith that when a teacher of the law asked Jesus what he believed was the most important of all the commandments, his answer was the Shema from Deuteronomy 6 (see Mark 12:28-31). If these verses were the most important commandments in the Bible that Jesus knew, we probably should be more aware of what they say and mean. Let’s take a closer look at each of the six Hebrew words and try to determine what God is saying. 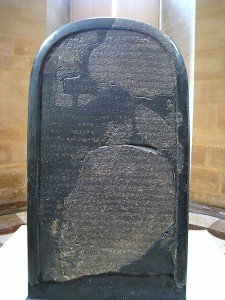 The Mesha Stele bears the earliest known reference (840 BCE) to the sacred Hebrew name of God – YHWH. YHVH (or YHWH) – Also called the Tetragrammaton (Greek τετραγράμματον), meaning having four letters. These four letters are the unspeakable name of God and occur over 6,000 times in the Hebrew Bible. As the pronunciation of God’s name was supposed to remain a mystery, his name is written without vowels between the letters. 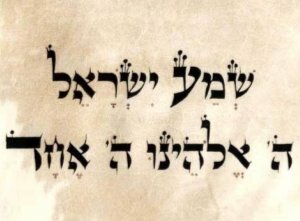 The Mishna states, “He who pronounces the Name with it’s own letters has no part in the world to come” (Sanh. xi. 1). The Jewish people had such a reverence for the name of God that they would not pronounce his name out loud. Instead, they substituted, “Adonai (the Lord) or “Hashem” (the Name). This paints an amazing picture! Our God is invisible, immortal, indescribable and his name is unspeakable! This is why many writers in English, when writing about the Lord, leave out the vowel and write, G-d, to show reverence for His unspeakable name. Although the Bible doesn’t specifically prohibit us from saying His Name, it does warn against using His Name in the wrong way or casually. This knowledge certainly gives us more of an awe when we recite the Shema! Instead of saying His unspeakable name we substitute Adonai and say, “The Lord (Adonai) is our God, the Lord alone”. Eloheinu – First person possessive and means, ”our God” and puts the proper relationship between Israel and YHVH. He alone is Israel’s God. Ehad – Means, “one” or “only”. There is not enough space to cover it here but the JPS Torah Commentary Series (Deuteronomy, pp. 76-77) translate “ehad” as, “alone” and explains why that is the best translation.. The Lord alone is the God of Israel and not the myriad of gods that were worshiped by the Egyptians and other cultures. YHVH was a jealous God and was to be their only deity. Israel was to recognize YHVH alone. To summarize, the Shema is much more than just a creed that we recite to define our faith or a prayer to be repeated. It is an oath of loyalty to the King of the Universe and call to action on his behalf! When we recite the Shema, we are committing ourselves to the Lord alone and to the way of life that He commands. Now that we have been called to attention and proclaimed that the Lord is our God, the Lord alone, let’s see what the Lord asks us to do. We’ll tackle verses 5-9 of Deuteronomy in our next lesson. We are so familiar with and say the name Jesus Christ so often that it almost sounds as if Jesus is his first name and Christ is his surname. You can almost picture his name in the Nazareth phone book as: Christ, Jesus; 77 Cana Rd., Nazareth! However, neither name was actually his name in his Hebrew language! What was his name in Hebrew and was there really something about his name that was different than the other names in his culture? This makes for an interesting study. “Yeshua” is Jesus’ name in Hebrew and Aramaic, the language that he spoke. The thirty three years he lived on earth, everyone called him by his Hebrew name. According to David Bivin, a well respected Jewish scholar, Yeshua was one of the five most common names given to Jewish males in the first century, along with Shimon (Simon), Yosef (Joseph), Yehudah (Judah), and Yochanan (John). In accordance with Jewish custom, he was given his Hebrew name at his circumcision on the eight day after his birth (Luke 2:21). His name was a common Jewish name, but did it have some uncommon significance when it came to identifying who Yeshua was and what his mission on earth was to be? In the Bible, Hebrew names are often a play on words. When God told Abraham that he was finally going to have a son at 100 years of age (Genesis 17:17-19), he fell face down and he laughed (Hebrew – va’yitzchak). God told him to name this son of the promise Yitzchak (Isaac) which means, “he laughed”. In the story of the birth of Jacob and Esau (Genesis 25:19-26), Jacob grabbed his twin brother by the heel (Hebrew ba’ akev), so he was called Ya’akov (Jacob), which means, “he grasps by the heel or he deceives”. There are many other examples like these in the Hebrew scriptures. This same type of word play is present with the naming of Yeshua. When the angel appeared to Joesph announcing the divinely ordained birth of a son to Mary, he said to her, “give him the name Jesus, because he will save his people from their sins”. This significant word play is lost in English, but is very clear in Hebrew. “You shall call his name Yeshua (he saves or delivers) for he will “Yoshia” (will save) his people from their sins. The Hebrew word for, ”he will save” is Yoshia, which has the same Hebrew root as the name,”Yeshua”. The Messiah’s name is explained on the basis of what He will do. Also, the name Yeshua is a contraction of the word, Y’hoshua (Joshua in English), which means, “YHVH saves”, and also the masculine form of the Hebrew word, Yeshu’ah, which means salvation. You can see that this is what the Bible writer in Hebrew wanted to portray because he says, call him the name Yeshua for he will Yoshia his people. In English, saving people from their sins is no more a reason for calling someone Jesus than for calling him Bill or Jim. Only in Hebrew does it make sense. 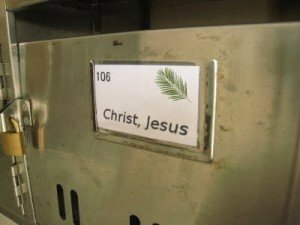 How then did we get the name Jesus from Yeshua? The word,”Jesus”, represents the efforts of English speakers to pronounce the name as it appears in the Greek. “Iesous” (yee-soos or yay-soos) was the word that Greek translators used to say Yeshua. The iota (I) was replaced by the letter J in Old English and thus came the name Jesus. Our current pronunciation of the English name, Jesus, seems far removed from the original Hebrew sounding Yeshua. What about the Christ in Jesus Christ? Christ is the Greek translation (Christos) of the meaning of the Hebrew title, “Mashiach, which means, the anointed one. Christ is a title, not a second or last name. The significance in Hebrew of being known as the “anointed one”, is that both Kings and Priests were given their authority in a ceremony that required anointing with oil. Therefore, inherit in the concept of Messiah (Mashiach) is the idea of being given God’s priestly and kingly authority. To use the title, Maschiah, the promised one in the scriptures, who would be a prophet, priest, and king that would save and lead the Jewish people, is much more revealing than just, ”Christ”. Jesus Christ’s real name in Hebrew then is, “Yeshua Ha Maschiah”. His name is not a magic word or some magical formula, that if we say it long enough or loud enough, miracles will happen. But, his name is extraordinarily powerful to us in light of its Hebrew meaning. How we say it is not nearly as important as how we carry it. To know that Yeshua is our salvation and that he is our promised and anointed King and Savior is huge. The way to honor his name is to walk in obedience to his commands and to conduct ourselves in a manner that would lift up and honor everything his name stands for. As Christians, many of us have grown up with a negative attitude toward the word, “law”. We have been taught that the word “law” refers to excessive and burdensome regulations. The word “law” is always used in the context of the law vs. grace, or the law vs. the spirit. But the word that we translate “law” actually has a very different meaning in Hebrew. Let’s look at what the Hebrews thought when they heard the word that is translated in our Bible as law. That word in Hebrew is Torah. The Hebrew word Torah is derived from the root word Yarah, (see “The Task of Teaching” lesson for more information) and means to point out, teach, instruct, or give direction toward a goal. It is that which aims you, (like a bow) so that you can hit the mark. Torah could best be described in English as instruction, God’s instruction to man. When God teaches us something we must obey. When the Bible was translated from Hebrew to Greek, the translators used the word “nomos” for Torah. “Nomos” was then translated into English as “law”. Obviously the word “law” is part of the definition of Torah, but it is not the main emphasis. The word law has a very negative connotation and makes us only think of harsh rules that we are required to obey. It is much more life-giving to God’s word to insert the word instruction or teaching for law. This makes the Text read in a much more positive light. The Jewish Bible (also called Tanakh) translates the word Torah as “teaching” in almost every case. Look at the difference it makes in the following verses where the Jewish Bible translation is compared to the NIV. Joshua 1:7-8 (NIV) “ Be strong and very courageous. Be careful to obey all the law my servant Moses gave you…Do not let this book of the law depart from your mouth, meditate on it day and night”. Joshua 1:7-8 (JPS) “But you must be very strong and resolute to observe faithfully all the teaching that my servant Moses enjoined upon you… Let not this book of the Teaching cease from your lips, but recite it day and night, so that you may observe faithfully all that is written in it”. The first five books of the Bible are usually referred to as the Torah or Law, but they contain much more than just laws. In the Torah there is the story of creation, the fall of Adam and Eve, the stories of Abraham, Isaac, and Jacob, and God’s deliverance of the Hebrew people from slavery in the Exodus. The actual laws take up a very small portion of the Torah. 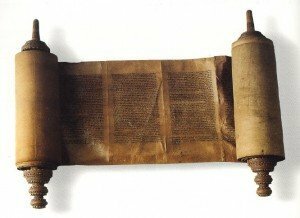 The reason the first five books of the Bible were given the name, “Torah”, was to emphasize that they were God’s teachings given to Moses, not that it was the law. In the future, when you read God’s Word, when the word, “law”, appears, say, “teaching” instead as the Hebrews did. This emphasis will help you see God in a more positive light, not as a judge ready to punish, but as a loving Father teaching and instructing us how to live. This knowledge also leads us to take a different look at the law vs. the Spirit. When Timothy wrote in 2 Timothy 3:16 that all Scripture was inspired by God, which Scripture was he talking about? The only Scripture he knew was the Torah! The word inspired at it’s root means, “in spirited”. The Torah was a gift of the Holy Spirit, written by the finger of God, (Exodus 31:18). “Finger of God” is a Hebrew idiom for the “Spirit of God”. Also, look at these verse in Romans; Romans 7:14 ,”We know that the law (Torah or His Teaching) is spiritual” and Romans 7:22, ”For in my inner being (inner spirit), I delight in God’s law (teaching, Torah)”. Also, think of this point: The law was given to Israel after they had been saved out of Egypt. The law was not the basis or means by which He saved them; He saved them by His grace. The Torah was given to the Hebrew people to guide and teach them and to bring them to the appointed place of promise. These verses and many others show that the “law” and the “Spirit” are really one and the same and are not in contradiction to each other. Hopefully, the next time you hear some negative words about the law vs. the Spirit or the law vs grace, you will be able to call this lesson to mind and turn it into a positive message.